For the school in Arizona, see Palo Verde High School (Arizona). 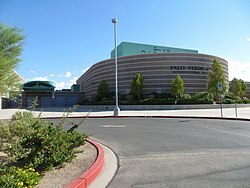 Palo Verde High School is a high school in Las Vegas, Nevada, United States. 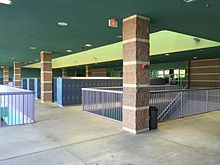 The school was built in 1996 with an adjacent 10 portable classrooms located in Summerlin, a rapidly growing affluent suburban community in the western portion of the City of Las Vegas and unincorporated Clark County. The origin of the school's name comes from the surrounding palo verde trees. The school's ethnic ratio is 59.4% Caucasian; 11.4% African American; 17.1% Hispanic; 11.5% Asian/Pacific Islander and 0.6% Native American. The school site includes a College of Southern Nevada (CSN) High Tech Center and an adjacent Parks and Recreation facility. ^ "Palo Verde High School". National Center for Education Statistics. Retrieved December 12, 2018. ^ "Student Teacher Ratio Palo Verde High School - Las Vegas, Nevada - NV". Greatschools.net. Retrieved 2013-10-25. ^ "Palo Verde High School". Paloverde.org. Retrieved 2013-10-25. ^ "Arianny Celeste News, Pictures, and Videos". TMZ. Retrieved 2013-10-25. ^ Locher, John. "Palo Verde Product resurrects his career". Las Vegas Review Journal. Retrieved 2013-10-25. ^ Keefer, Case. "Former Palo Verde star ready for camp with the Browns". Las Vegas Sun. Retrieved 2013-10-25. ^ Weatherford, Mike (June 17, 2011). "Las Vegas' Panic! at the Disco playing House of Blues after weathering lineup changes". Las Vegas Review-Journal. Retrieved May 26, 2013. This page was last edited on 7 March 2019, at 17:33 (UTC).